At Aakash LIVE since the inception we have spent over 14,300+ hours imparting online coaching to 3600+ students. Aakash LIVE prepares for competitive exams with integration to the regular classroom schedule. These classes are interactive - students can ask questions during the class and get instant answers from respective faculty. All this will lead to excellent results in competitive & board exams from the school. It will improve not just student/parent satisfaction, but school brand equity too. 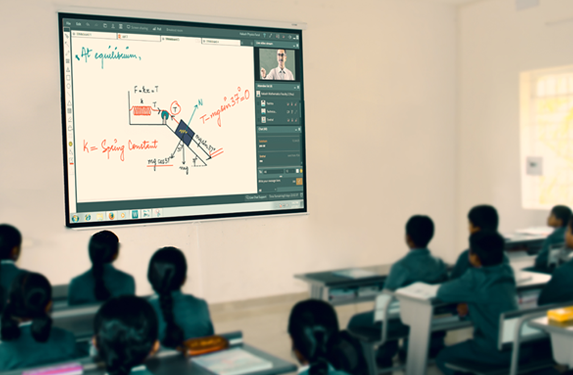 This next generation learning solution will catalyse students' learning and thereby boost their results (both in board as well as entrance exams). This program will add to the school's USP and will enhance the school's brand and thereby boost enrolments. The school can mention "Powered by Aakash Live" in school information brochure, handbills etc. with prior approval from Aakash Educational Services Pvt Ltd.
A 6'x4' display board will be provided to the school with "School name powered by Aakash Live"